Ember Swift | » Public Announcement: "Coming Out"
So, I’m finally announcing the news publicly today. That means that I can stop blogging like an anonymous person and start referring more openly to the rest of my life. Some of you are just checking out this blog for the first time and these are the first words you’re reading. For those of you who have already been following this blog (the few and loyal! ), I’m here to share that I’m a Canadian musician and performer and so is my partner who is also my husband (although he’s Chinese). My name is EMBER SWIFT and he is Guo Jian 国囝 of Long Shen Dao fame (龙神道), a Chinese reggae band. He’s a bit of a rock star here in China and I’m definitely not a star, but I have a strong following of beautiful people all over the world who I hope will be SO HAPPY for us to hear this news!! In “coming out” about my pregnancy to others and my actual name and background (outside of just being a Westerner in China married to a Chinese guy), I feel finally free to trust in this pregnancy. It’s funny how not telling anyone except for some close friends has made it almost feel like a secret fantasy or a dreamlike reality that isn’t necessarily going to come true. As soon as I posted onto my Facebook walls and sent it out into the world, something clicked and shifted in me, making me feel like throwing a huge pregnancy party!! You see, these past two days have also coincided with a slowing down of my nausea and general illness. I have had “night sickness” rather than “morning sickness.” My fingers are crossed that I’ll start feeling more and more like my old self again (with the exception of the growing belly!) rather than the revolting, heaving, nauseous, miserable waif that I was under a cold, wet cloth and flat out on the bed at 7pm most nights. If “coming out” about my pregnancy to the world is not reason enough to celebrate, then coming into my second trimester and starting to feel normal again is reason enough on its own! 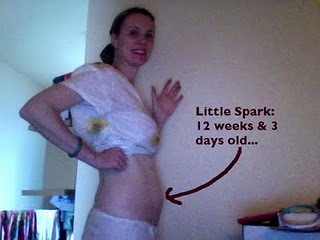 Above is a pic of my 12-week-and-3-day-old “Little Spark,” but this time you can see that it’s me (in my pj’s) as I wave at the camera. Good thing you can’t smell me this morning because, woooo-eeeee, I sure need to take a shower! So, welcome to this blog… and please send me feedback and comments!